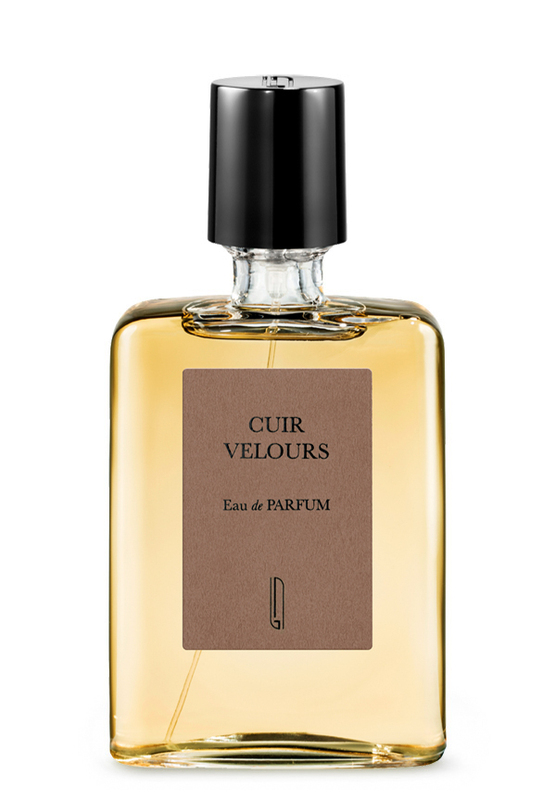 There are 12 reviews of Cuir Velours. Somehow, I had high hopes for Cuir Velours. I love fruit-suede fragrances like Visa and Daim Blonde, and am slowly coming around to the idea of Traversee du Bosphore. Indeed, there is something in the fruity, syrupy heart of Cuir Velours that reminds me of the cherry-pomegranate-apple syrup in Traversee du Bosphore, and also something of that pink-grey powdered suede with a thick dusting of icing sugar on top. To say that Cuir Velours has something of a lokum feel to it would perhaps be going too far. But there’s a familial connection, and it’s interesting to me. animalic leather with very good staying power and sillage! Cuir Velours suffers from the same malady as its sibling, Bois d’Ascèse. The problem isn’t the fragrance, it’s the strategy. So let’s get the perfume out of the way. It’s a waxy, fruity leather. Less soapy than Serge Lutens Daim Blond, more spiced than Robert Piguet’s revived Visa. A pretty fruit/leather that smokes and drinks. Very nice, truth be told. But, why? Is niche perfumery strictly about branding. Say you sell a luxury fashion commodity. Shoes, purses, phone cases. Hats. Must a line of perfumes be part of the business plan? The smugness of viewing niche perfumery as a merely a style to be taken up and dropped is certainly nothing new, but the niche version seems dismissive by design. I know that there need to be business opportunities for up and coming perfumers, but is niche perfumery the lapdog of fashion businesses? The thought that niche perfumery will serve to accessorize fashion is disheartening. Taking the focus away from exploration and placing it on the production of perfumes ‘in the style’ of niche is exactly how the soul is sold. Niche orthodoxy. It will be the death of us. Cuir Velours, for me, is the weakest scent in the Naomi Goodsir line. It’s a floralized, sweet leather with an herbal presence that seems to be a cardamom / saffron combination. The problem with this scent is that the leather note is ill-defined — flat and surprisingly vague. Furthermore, the scent is very sweet — probably at least two notches beyond what most would deem appropriate for this style. The sweetness is caramel, and it does compliment the more floral and herbal components, but end result doesn’t add up to much. Over time the sweetness increases, and it reminds me a little bit of Cuir Amethyst — although perhaps not quite as sweet as that one. And then it all becomes a scratchy, norlimabanol-driven cardboard suede. I think that the ultimate nail in the coffin of this one, though, is simply that there are so many better versions of leather available than this one. If you want a leather where the leather’s turned down, and gourmand and savory facets are turned up, then it’s worth a sniff. For me, it holds little appeal, and it’s especially mediocre in relation to the jaw-droopingly good Bois d’Ascese and even the less-good-but-still-good Or du Serail. Halfway between Daim Blond and Cuir Ottoman, a delicate but bold floral suede accord, less fruity and rich than Daim Blond (globally less "oriental", I'd say), rather tending to a sharper, more Western and contemporary approach to suede scents like in Tuscan Leather – kind of a highstreet shoes shop feel, clean, soft and cozy. Persistent talcum-sweet drydown like in the abovementioned suede-based scents. It is good, even really good, but at the same time it's just that I don't feel anything in here that would make me add this to my collection – since it already includes Daim and Cuir and they both "give" me that, plus a lot more each. I'm not good at identifying and describing notes, so let me just say that I love this. For me it's all about how the fragrance makes me feel. Cuir Velours just wraps around my head with the most wonderful, soothing fragrance. Not too sweet, not spicy - just right. Naomi Goodsir Cuir Velours 50ml EDP Sealed in Box Authentic & fast, Finescents! There are no member images of Cuir Velours yet. Why not be the first?